In line with its philosophy of “Freedom Reimagined”—a thinking that shapes the resort's physical design and its programme of unforgettable experiences—Kudadoo Maldives is a tropical island getaway for the adventurous. 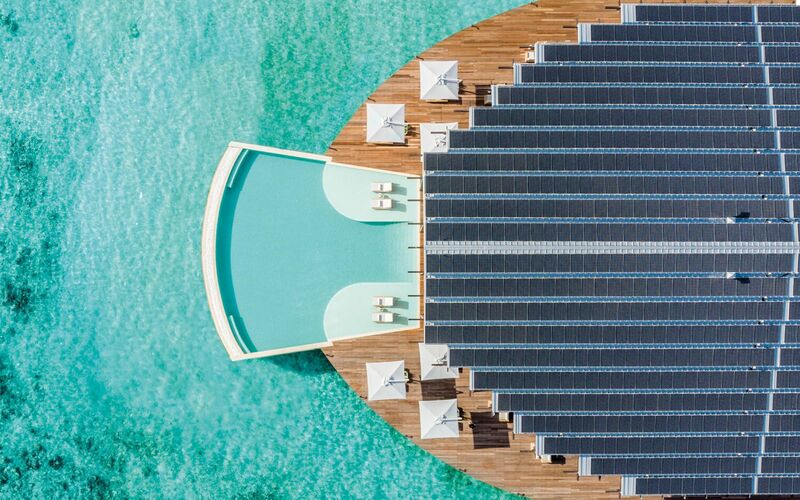 With sustainability as its core ethos, the resort is fully powered by 984 solar panels (pictured in the article's lead image) positioned above The Retreat, a two-storey architectural masterpiece, where guests can wine, dine and socialise in style. Designed by architect Yuji Yamazaki, Kudadoo is also extra exlusive with only 15 expansive overwater ocean residences. Tatler Tip: The resort features a wellness retreat centred in the luxurious Sulha Spa, where guests can enjoy the Lonu Cave—the first Himalayan salt chamber in the country. Set in the pristine oasis of Gaafu Alifu Atoll, Raffles Maldives Meradhoo boasts 38 stunning beachfront and overwater villas made for travellers who want to immerse themselves in nature. Hop onto a Maldivian dhoni, a traditional sailboat, to explore the region’s thriving marine life, as the resort’s marine butlers guide you around the two vibrant reefs home to baby sharks, sea turtles and tropical fish. Better yet, go snorkelling with their in-house marine biologists to discover the breathtaking underwater life of the Indian Ocean up close. Tatler Tip: For extra exclusivity, book the Raffles Royal Residence, which comes with a private beach and the renowned 24-hour Raffles butler service. Those seeking la dolce vita will have much to look forward to this June as Italian hotel brand Baglioni opens at the tropical haven of Maagau in the Dhaalu Atoll. Baglioni showers meticulous attention on the finest details with beds swathed with Frette linens and bathrooms filled with Insium anti-ageing amenities. For the perfect weekend, we suggest embarking on a cruise under the starry sky, where you can admire the constellations with your significant other while sipping on a glass of Ferrari Trento bubbly. Tatler Tip: The Presidential Water Villa boasts three generously-sized bedrooms, perfect for a group of six to enjoy. Equipped with a jacuzzi, pool and veranda with a spacious dining area, it is ideal for an unforgettable family holiday reunion. As a newcomer to the luxury hospitality game, Joali Maldives surely knows how to make an entrance. Opened in late 2018, the 73-room resort is housed on an unspoilt part of northern Maldives in one of the world’s largest and deepest atolls, Raa Atoll. As the first and flagship property of the Joali brand, it has ensured some major talking points: a luxurious, dedicated seaplane lounge; the longest jetty in the Maldives measuring 1.3km; one of the largest entry-level villas at 240sqm, and, reflecting its owner’s Turkish roots, a stunning monochrome hammam. Tatler Tip: The Joali brand espouses the “joy of living” and has a singular focus on art and craftsmanship. One-of-a-kind art pieces are peppered across the property—hung on the wall, standing on the shelf, and even assembled on the plate. To be immersed in an artist’s paradise, now, isn’t that a joy? The design of Lux* North Male Atoll is inspired by the opulent yachting lifestyle, which explains why its architecture references the curves of a sail and the elegance of Riva yachts. Perched on Olhahali in the North Male Atoll, this intimate resort designed by Singapore‑based Miaja Design Group is the perfect escape from the pressures of city life. All of its 67 penthouse villas come with their own private rooftop terrace for the ultimate relaxation. Tatler Tip: Each spacious villa opens up to a beachfront or overwater living space that renders every moment an Instagrammable one. Upon arrival at the Waldorf Astoria Maldives Ithaafushi, which is a mere 20min speedboat ride from the Male International Airport, guests can personalise their stay with the legendary Waldorf Astoria service, from culinary preferences to special occasion details. With 119 oversized beach and overwater villas set on three islands in the South Male Atoll, guests are extra spoilt for choice. Separated from the main resort is the Ithaafushi private island, accessible only by speedboat, and equipped with a private concierge, plus its own beach and pools. Tatler Tip: Carve out time to dine at Terra, a restaurant that allows guests to dine in the tranquil setting of the treetops. Crafted with natural bamboo, the pods are able to seat two to four guests, making it ideal for an intimate dinner get-together. Situated just a bridge walk away from its sister resort on Falhumaafushi in the southern Gaafu Alifu Atoll, The Residence Maldives Dhigurah has 173 beach and water villas, each designed with the finest local materials and complete with its own private pool. Pamper yourself at the renowned Spa by Clarins perched at the end of the jetty. With an array of holistic treatments and massages, it has 10 thatched roof pavilions overlooking the tranquil waters of the Indian Ocean. In the evening, savour fine food at the resort’s signature Cantonese restaurant, Li Bai, before heading to Long Island for a nightcap. Tatler Tip: For an even more memorable evening, choose from a selection of private dining experiences: from dinner on a private island under the starlit skies to a beach barbecue with your loved ones. For a storied brand like Westin, it is surprising that The Westin Maldives Miriandhoo Resort is the group’s first foray in the sunny island state. But it is worth the wait as the hospitality giant pulls out all the stops to make a stay at the resort a memorable one. Designed by award-winning architects, Peia Associati, the Italian firm behind the Katara Headquarters in Doha, Qatar and the Cultural Center Ikeda for Peace in Milan, Italy, the resort boasts 70 overwater and island villas located in the only UNESCO Biosphere Reserve in the Maldives, close to the Hanifaru Bay. Tatler Tip: The resort’s focus on sustainable living is evident in every touch point. Its villas are encased in a contemporary shell-like structure, which does not trap heat, keeping temperatures low and reducing the need for air conditioning and thus minimising the resort’s impact on the environment. An eco-friendly holiday in paradise, what's not to like? Ringed by the crystal clear waters of the Indian Ocean and located in the centre of the largest developed coral lagoon in the north of the country, one will find the exquisite Fairmont Maldives. An exhilarating 55min seaplane ride from Male, the resort is set in Maldives' "secret water island", the island of Sirru Fen Fushi. Apart from offering beach and overwater villas, the 120-room resort also includes castaway tented jungle villas, each equipped with its own private pool for guests to enjoy. Tatler Tip: The Fairmont Maldives is also home to The Coralarium, a semi-submerged tidal gallery structure that supports the coral restoration programme, created by eco-artist, Jason deCaires Taylor. Guests will be able to snorkel and get up close with the region's diverse marine life, led by the resort's resident marine biologists. It’s not every day that a residence such as The Muraka pops up on the discerning traveller’s radar. Crowned as the first of its kind, luxury brand Conrad has beaten hoteliers in the race of constructing a truly one-of-a-kind stay with a two-storey underwater villa like no other. Located on the South Ari Atoll of the Maldives, this expansive villa is part of the Conrad Rangali Island resort, and home to three luxurious bedrooms, a dedicated living area, kitchen, bar, gym, bathroom, and even the butler’s quarters, with a total ability to accommodate up to nine guests. Tatler Tip: Wake up to views of the infinite Indian Ocean when you stay in The Muraka’s undersea bedroom, five metres below sea level. The private viewing theatre in the underwater suite also provides 180-degree panoramic views of the bustling marine life. Scheduled to open in the later part of 2020, the Capella Maldives will launch alongside the Capella Estate Residences, as part of the hotelier's initiative to be the first to build a luxury integrated island community destination in the Maldives. Located in the Rah Falhu Huraa Atoll, north of the capital Male, the hotel consists of 64 distinctly designed villas and mansions; there are also 29 private estate residences, each curated to suit the taste of each investor for maximum enjoyment of their piece of paradise. With its construction spearheaded by a stellar team of designers—including Kengo Kuma & Associates from Japan, André Fu's AFSO from Hong Kong, and Lebanese-based landscape architect Vladimir Djurovic, one can expect nothing but the very best once it opens. Tatler Tip: To better tailor your stay, guests will be able to choose between one- and two-bedroom villas, or two-storey mansions featuring up to five bedrooms to accommodate you and your travelling party. From swimming with manta rays to indulging in epicurean delights from around the world, one can have it all at the InterContinental Maldives Maamungau Resort, which is slated to open in October 2019. Every facet of the hotel—including each of the 83 beautifully designed rooms—will be anchored with sustainability at its core. Working in close partnership with UK-based charity, Manta Trust, the brand is committed to furthering the conservation efforts of the majestic manta rays and encourages guests to be involved in preserving the region's wider marine ecosystem. Living in the lap of guilt-free luxury has never felt so assuring. Tatler Tip: Happy trippers can look forward to the "adults-only" pool area, where busy parents can finally have a breather and look forward to a quiet afternoon. Just you and your drink in hand, catching up on the book you have always wanted to read while basking under the tropical sun. Now, that's enough reason to book a flight, stat.